The night life continues to be a vibrant scene in cities across Australia. In between the offices and the outdoors, going to drinking pubs and night restaurants has become the quickest option for unwinding and a brief escape from the chaos of daily life. In Sydney alone, restaurants and pubs continue to introduce new experiences, tastes, and sights and sounds to their customers. If you are about to open doors to a new restaurant or are thinking about redesigning your interiors, below are some quick terrazzo and interior design tips to help you make that drinking pub and night restaurant inviting and worth returning to. Screens and digital devices expose people to blue light throughout the day. Make your place warmer and more inviting by installing warm light and matching it with beige and yellow terrazzo marble flooring. If your pub is going for the rustic look, pair these with wooden furniture and no-fail cushions and couches to make it comfortable. If your pub will surely include a bar, never miss the chance to use Terrazzo for your bar top and pair it with bronze accents such as your glass rack or bottle holders. 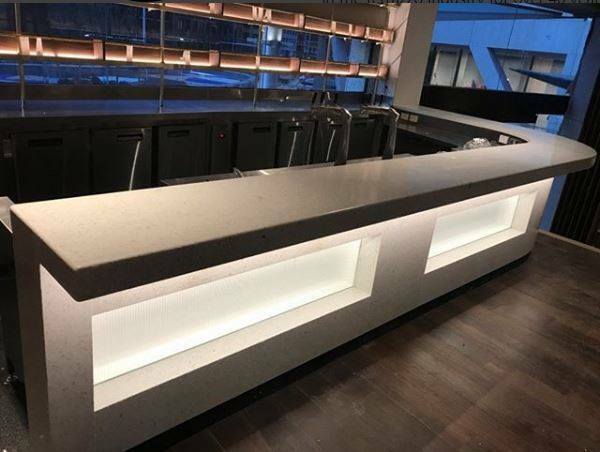 Depending on your restaurant’s theme, you can pick colors for your terrazzo bar top that would best complement your bronze accents. People get creative when drunk. Vandalism may be inevitable for many drinking pubs. Using terrazzo as your partitions makes it easier to maintain and clean up after-the-fact. Putting Terrazzo as your sink counter also adds to the ease of maintenance as it is easy to wipe off and clean up for busy pub and restaurant staff. Air in drinking pubs, especially those with indoor smoking areas, can become too heavy. For restaurants with no outdoor access, it is best to get some help from plants to serve as your natural air filters and purifiers. Plants in night pubs may look odd, but if you match your existing terrazzo elements, such as your flooring, your bar top, your toilet partitions and sink counters, with terrazzo pots to hold the plants, it would surely blend in with your pubs’ interiors. Terrazzo is your ideal pick to keep your drinking pub and night restaurant warm, inviting, and modern. Talk to Terrazzo Australian Marble today to check how you can incorporate Terrazzo into your pub and restaurant.